With all the fun zoodle recipes going around, we thought it would be great to try making a spiralized soup! 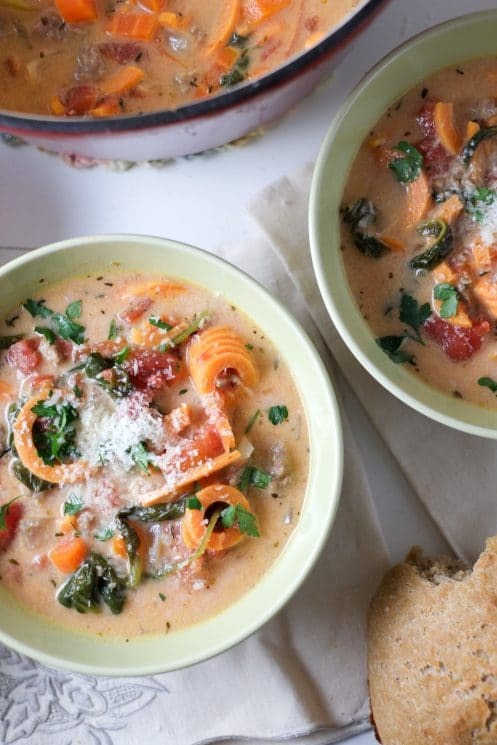 If you don’t have a spiralizer, don’t worry!You can still make this soup. 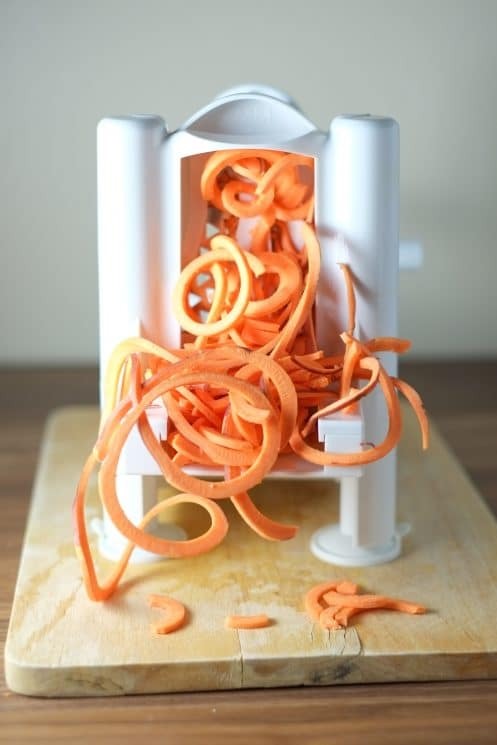 Just julienne your sweet potatoes instead, or make wide noodles using a peeler. Or, if you want to go traditional, simply cut your sweet potatoes up in plain old cubes (they’ll still taste great!) – you may just want to add them earlier so they cook all the way. 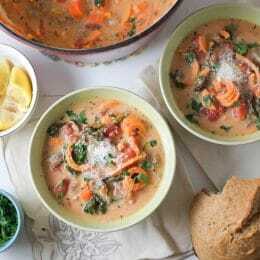 My husband was skeptical about another kitchen gadget, but when I concocted this delicious soup (and some curly fries), he admitted it was pretty neat. Honestly, sometimes the shape and texture of veggies makes the difference between eating them and not. So if this helps you twirl a few more veggies into your families’ meals, why not?! This soup comes together so quickly! You’ll be ready to eat in less than 30 minutes, easy. First, cook your ground Italian sausage. I have read recipes where you’re instructed to squeeze Italian sausage out of sausage casings, but I was able to find ground sausage in a package just like ground beef at my local grocer. Yay for time saved and gross jobs avoided. Once cooked, just set the sausage aside on a paper towel-ed plate (aka: a plate with paper towels on top) and set aside. In a large pot, add olive oil, onion, and spices. Sauté for a few minutes until the onions are starting to go translucent. Then add in your chopped carrots and minced garlic and let those cook for a couple minutes. Now it’s time to make this soup soupy! Add in the broth and diced tomatoes, as well as the cooked sausage you set aside. Bring to a boil and simmer for five minutes, until the carrots are softening. Then add in the spiralized sweet potatoes and let everything boil for a few minutes, until all veggies are tender to your liking. Add four giant handfuls of spinach (it will look like it’s taking over, but when spinach boils down it’s so much smaller!). Once this wilts, add in your cup of half and half. We used half and half rather than cream to cut down on fat, but it’s still nice and rich! Bring this all up to a simmer just to make sure it’s heated through and then remove from the heat. Serve garnished with parmesan cheese, parsley and/or lemon wedges, if desired. I enjoyed the extra tang of lemon in mine. And of course parmesan is always a winner for me. I didn’t need to add any salt to this soup, even with reduced sodium broth. Plenty of salty and flavorful things already in it! Some variations: use chicken rather than sausage, or try it vegetarian! 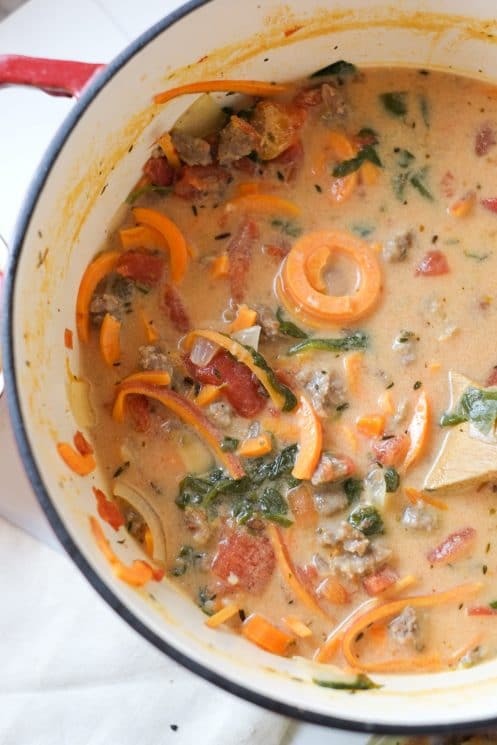 The flavor of this soup would be delicious even without the meat, in my opinion. Add in some white beans for extra protein, fiber and vitamins. Swap the spinach for a couple handfuls of kale. The possibilities are endless! 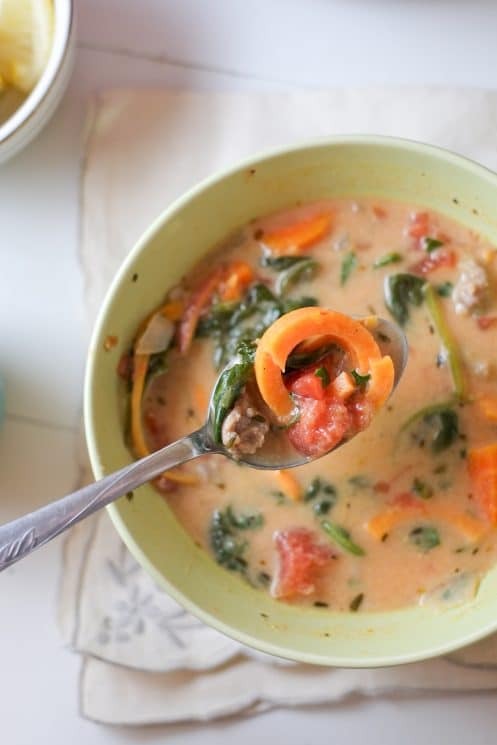 I hope you enjoy this hearty, delicious soup! I know I did! Chop onion and carrots; mince garlic; spiralize sweet potato. Cook sausage in a skillet and set aside on a paper towel-lined plate. In a large pot on medium-high heat, add olive oil, then spices and onion. Saute until onions begin to go translucent. Add carrots and garlic and saute for another 2-3 minutes. Add chicken broth, crushed tomatoes, and cooked sausage to the pot and bring to a boil. Simmer for 5 minutes, then add spiralized sweet potatoes. Cook for 3 more minutes, or until all vegetables are softened to liking. Add spinach, and once wilted add half and half. Bring the soup up to a boil just to make sure everything is heated through and then remove from the heat. 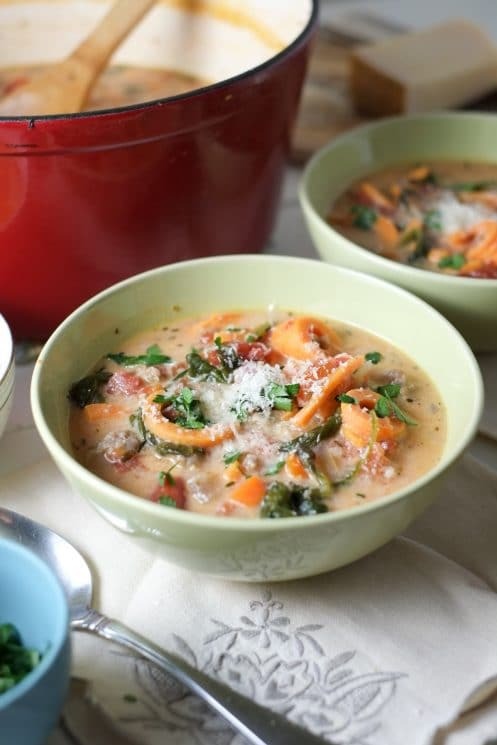 Serve garnished with parmesan, parsley, and lemon wedges that can be squeezed into the soup for extra tang. Do you think this would be good without the half, and half? My daughter has a dairy intolerance. Is there a substitute that could work? My kids loved it! We ended up skipping the half and half because I have a little one who doesn’t do dairy, and it was still super good! Thanks for a great recipe. I made this for the first time and changed it up a bit! I used Italian chicken sauagage instead of pork. Didn’t use carrots and I put swapped the spinach for kale! Sooo yummy and great for the fall! Sounds delicious! 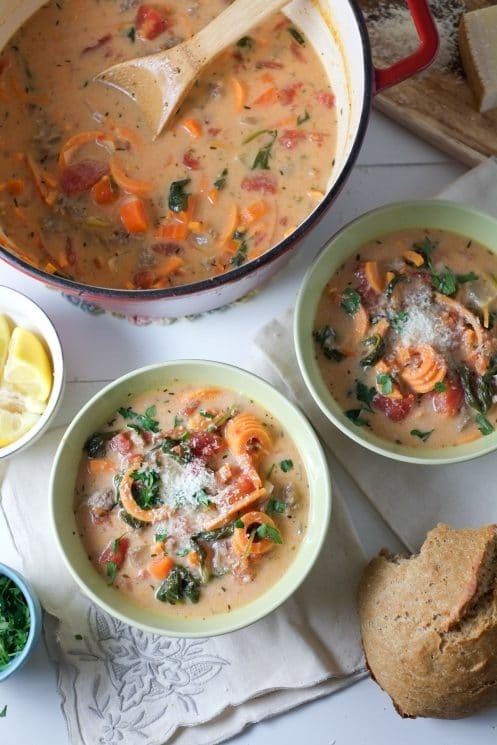 We love this soup.